We're so stoked to announce that we are collaborating with CreativeLive on producing "Night Photography Week" this September. And all five National Parks at Night instructors—Gabriel Biderman, Chris Nicholson, Lance Keimig, Tim Cooper and Matt Hill—will be on screen to help you plan and execute awesome night photography projects and experiences. My segment of the course will cover Astro-Landscape Photography—that is, photographing in dark sky conditions for star trails or star points and Milky Way imagery. While recording an in-the-field segment, the crew and I had an amazing unexpected celestial experience. I had just taught a workshop in Bodie State Historic Park in California’s Eastern Sierra, and since I was already in California, and CreativeLive has a base in San Francisco, we decided to film in the Alabama Hills. This great night location is also in the Eastern Sierra, about 100 miles south along the Highway 395 corridor. This turned out to be a serendipitous decision for several reasons. The Alabama Hills in California's Eastern Sierra are a great location for night photography and light painting. If you are not familiar with the Alabama Hills, it’s a unique geologic area in the foothills below Mt. Whitney, the tallest mountain in the continental United States. There are dozens of unique rock formations, most notably the famous Mobius Arch. It’s a fantastic place for night photography, and a place where I often teach workshops (including one this October). The eastern Sierra in general is somewhat of a Mecca for night photography, with many great attractions such as Mono Lake and nearby Yosemite National Park. On Wednesday, July 27, the CreativeLive team and I were scouting the location to prepare for our shoot the next night, hoping to see a few meteors from the impending Delta Aquarids meteor shower. We were not disappointed, but the highlight of the night had nothing to do with the Delta Aquarids! At 9:38 p.m., we witnessed a tremendous fireball streaking across the sky. 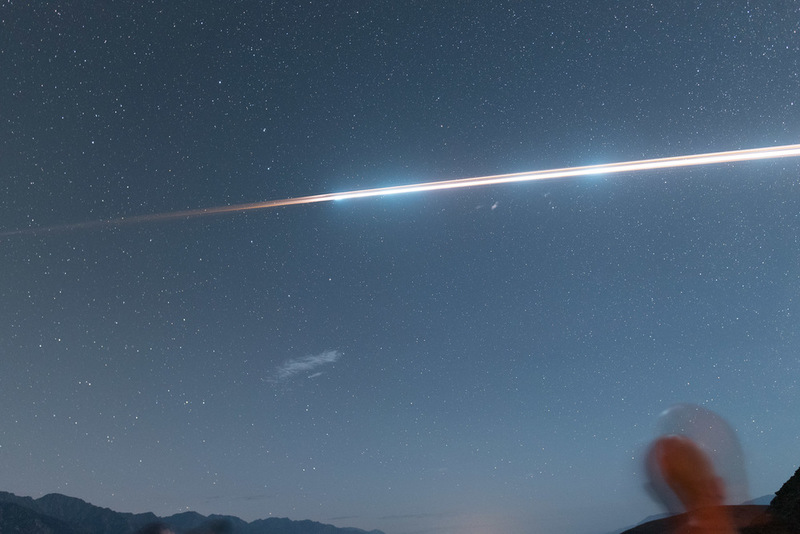 It turned out to be 8 tons of aluminum, the remnants of a Chinese CZ-7 rocket disintegrating as it re-entered the atmosphere! In addition to the pyrotechnics, Ian Norman from LonelySpeck.com was on-site with us, talking about his infinity focusing aid, the SharpStar2. The SS2 is based on a device used by astronomers, called a Bahtinov Mask. SharpStar uses the properties of optical diffraction to create a set of three fine spike lines around a bright star. These diffraction spikes shift position as you focus your camera; adjusting focus so the central diffraction spike sits evenly between the other two diffraction spikes ensures perfect focus. While the fireball made news across the several states where it was seen that night, we took it as a sign that Night Photography Week was off to a roaring early start. Working with the crew from CreativeLive was fantastic—they were enthusiastic, fun and professional, and we spent two long nights filming the content for my upcoming segment of the course. Gabriel Biderman will be teaching the fundamentals for all the night-photography beginners out there, exploring gear, how to catch the stars and the dynamic landscapes when photographing in national parks, and also when capturing in urban settings. Chris Nicholson, the author of Photographing National Parks, will help photographers prepare for their night shoots, from planning which parks to photograph, to fundamentals of safety, and how to scout locations for night photography shoots. Again, I will cover how to capture truly out-of-this-world imagery, including how to capture the Milky Way and star trails. Tim Cooper will introduce both the basics and the finer points of light painting, adding a dynamic element to your landscapes with light writing or accenting different elements of your compositions. Lastly, Matt Hill will teach how to do night portraits. Using your friends or models, discover how you can capture amazing portraits in urban environments and national parks, without losing the amazing sky as a background. The program airs September 12 to 16, and will be free during the initial broadcast. Afterward, lifetime access to the entire series can be purchased for $199. Join us to uncover and capture the night sky. RSVP now! NPAN is thrilled to be working with CreativeLive on what we hope will be the first of many collaborative efforts together! Lance Keimig has been photographing at night for 30 years, and is the author of Night Photography and Light Painting: Finding Your Way in the Dark (Focal Press, 2015). Learn more about his images and workshops at www.thenightskye.com. Older PostTalks & Walks: Visit us at two great NYC conferences this October!